A light snowfall descended upon Gordon Park on Saturday afternoon as the Scribes Men lined up against Rowers. The home team started well in defense, turning away the Rowers opening attack and then marching swiftly into the opposition 22. Setting a physical tone early on, Scribes were able to earn a penalty near the uprights, and Dadou Delachou made no mistake, putting the Scribes ahead 3-0. Rowers responded, however, making use of a quick tap penalty under the Scribes posts, which caught the defense a bit flat footed to claim a 7-3 lead. A few minutes later, Scribes were able to apply pressure deep in Rowers territory, and while they were turned away at the line once, the Scribes forwards would not be denied a second time. Eight-man Artur Farini plunged over the line to claim his fifth try of the season. Farini has shown an unmatched enthusiasm for try scoring, and he should have his eye on Brazilian national team aspirations if his rugby skills continue to progress. The Rowers were quick to reply, though, with a try of their own to go up 14-10, which held up as the half-time scoreline. Scribes worked hard to reclaim the lead, but at the 60 minute mark Rowers managed to score in the corner on an overlap. They then sealed the game on a penalty try with two Scribes already in the sin bin. Final score: Scribes 10-26 Rowers. This was the first-ever women’s match between Scribes and Rowers, and full credit needs to be given to both clubs for their efforts in developing, encouraging and promoting women’s rugby. This was clearly a match between two teams on the rise. Scribes started well, with a solid scrum leading to a clean ball for Didi Dufresne and a casual pass to speedster Whitney Paronish-Rowe, who took care of the rest. Paronish-Rowe was later the beneficiary of some classy running and passing by Scribes centres Ely Wilson and Marina Gray, pushing the team’s lead up to 12-0. Another first-half try from Paronish-Rowe stretched the lead to 17-0, but Rowers were far from fading away quietly. The visitors put in a strong, physical shift in the second-half, including a hard-earned try in the corner, but the Scribes forwards carried the day in the breakdown and set pieces. Cat Power and Ely Wilson marked tries in the second half to help boost Scribes to a 27-5 victory. 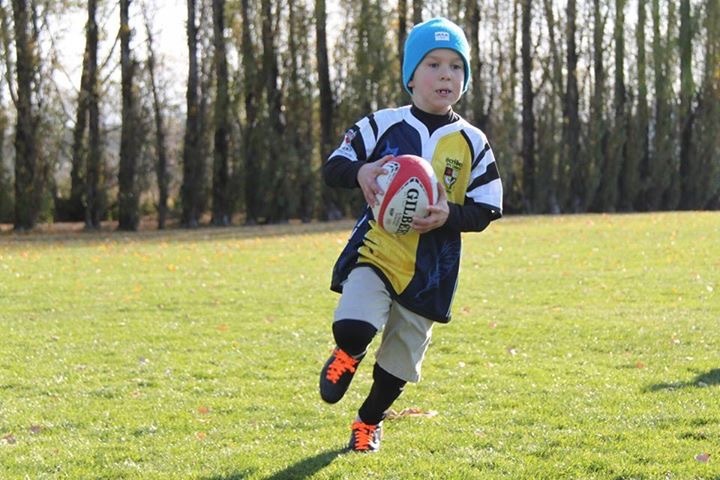 It was a cold, crisp autumn morning that greeted the contingent of Mini’s players and parents gathered on Sunday at Burnaby Lake. While it may have been hard at first to discern the chattering teeth from those with genuinely smiling faces, the kids were soon making the most of the frosty conditions. It’s been a great season for the Scribes Mini’s, and this Sunday was no different. Thanks to the Lakers for hosting, and to everyone who came out to support the Mini’s program.